Need to Know Precise Dimensional Shapes of Surface Features? The Signature Technologies SA-2000 “SAM” module, and Signature Technologies “SAMview™” Software package can be used to non-contact evaluation of specific features on manufactured parts. This can include dimensional profiling of each and every part in process! The illustrated method can perform the same type of test continuously as the part is manufactured, and optionally perform adjustments to the process to maintain the parts within specification. Hole diameters, slot widths, protrusion profiles, bend angles, or any other surface shape can be profiled. The system works by scanning the work piece with a triangulation laser to capture the surface profile. 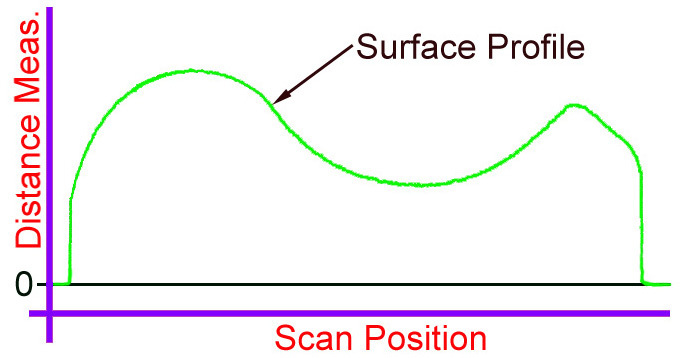 A high quality laser must be used because of the relatively severe angles encountered on the measured surface as shown. Differential measuring for “on the fly” measurement is also possible with multiple laser units. Post processing of the measured data also gives the ability to confirm that the radius is properly formed, and is a true radius. If the radius is true, then the center of the radius can be developed in both horizontal and vertical axes.